High Amplify Proforma Hairspray is rated 5.0 out of 5 by 5. 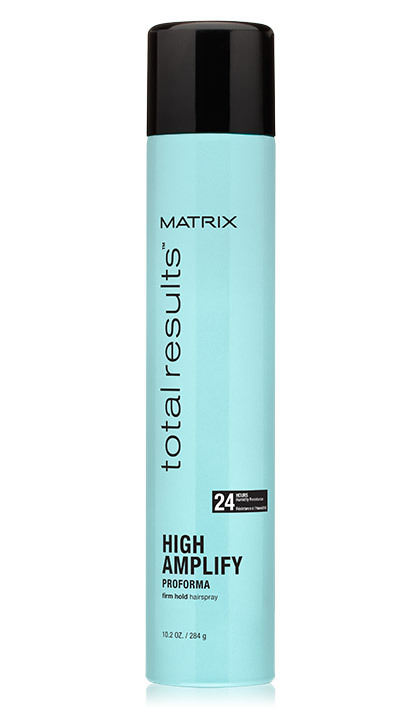 Share https://www.matrix.com/total-results/products/high-amplify/high-amplify-performa-hairspray High Amplify Proforma Hairsprayhttps://www.matrix.com/~/media/images/haircare/totalresults/high amplify/total_results_high_amplify_performa_hairspray_tr-ha-ph.jpg Locks in styles and adds intense shine. High Amplify Proforma Hairspray is a firm hold, texturizing and finishing spray for extra lift with our maximum hold. Ultra fast-drying formula locks in styles and adds intense shine. To use: Hold 8-10 inches form head. To texturize and molding hair into place, spray in short bursts. For final hold: spray evenly over style. Clean nozzle frequently to avoid clogging. If clogging occurs, run nozzle under hot water. Rated 5 out of 5 by BAY4EVER from LOVE IT! As the others have said, it is the best and I have fine hair too. This spray holds it in place without being stiff AND, it holds all day. But, also as the others said...PLEASE MAKE A TRAVEL SIZE! Rated 5 out of 5 by Rosie1 from Great Hairspray I have only been using this hairspray for a short time. I LOVE IT!!! It is the best hairspray I have ever used. The one thing that keeps it from being my sole hairspray is the large can. I travel frequently and would love to see a travel size. Rated 5 out of 5 by kathym from Holds hair all day Great hairspray, but I have to use a different brand when I travel (which is often) because you don't make a travel-size. Please make a TRAVEL SIZE!! Rated 5 out of 5 by KScoop from The best for my fine hair!! I have been using Proforma for 16 years. It gives me volume & texture, and it keeps the static away. I have tried other hairsprays throughout the years, but have found none can compare. My only issue is when I travel it is such a large can. Please Matrix, make it in a travel size!